In an exclusive interview with SME Times, Saurabh Baishakhia, ‎Sr. Vice President and Business Head, Appliances, Orient Electric, said that low quality and counterfeit consumer electric is a concern for the domestic industry. Orient Electric is a known name across the country. We would like to hear about the company's history and it brilliant entrepreneurial journey? Saurabh Baishakhia: Orient Electric, has evolved with time embracing new frontiers in technology and innovation to delight its customers with new and innovative offerings. Back in the early 1950s, inadequate infrastructure was a key challenge facing the manufacturing industry and making high quality products was the need of the hour. It was the thought of contributing to India’s economic growth that led to the establishment of the erstwhile Calcutta Electrical Manufacturing Company which became part of the CK Birla Group in 1954. Through these six decades, Orient has kept its brand story relevant – evolving with the times and venturing into new product segments in sync with market needs. A household name in the Indian fans industry for more than six decades, the company over the years has diversified into lighting, home appliances and switchgears to emerge as a one-stop brand for electrical lifestyle solutions. The continuous evolution and rejuvenation process has helped the company stay ahead of the competition and close to the customers. We take pride in our R&D capabilities, spirit of continuous innovation and commitment to manufacture cutting-edge lifestyle electrical products that meet the needs and expectations of new age consumers. Recently, the company announced its association with Indo-Global Social Service Society to donate 100 units of advanced wall-mounted room heaters across night shelter homes in Delhi NCR. Please let us know about the noble initiative. For homeless people, Delhi winters bring a whole lot of distress especially among families with small children. 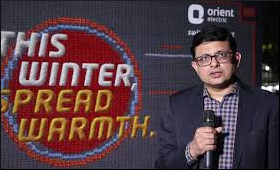 While government and NGO’s are doing their bit, we at Orient Electric felt that as we have a vast product range of room heaters we can also positively contribute in a way which helps the homeless to stay warm in the chilly winters. So that’s the reason we approached Indo-Global Social Service Society (IGSSS) and donated 100 units of advanced wall-mounted room heaters across night shelter homes in Delhi NCR in December ‘17. The activity was carried out through their ongoing initiative ‘Winter of Hope’ to create better conditions for the homeless during harsh winter months. More than 4000 homeless people have benefitted through this initiative. We are sure that the room heaters will bring much respite from the cold weather and provide comfort for the needy. Orient Electric offers a range of products. What is the competitive edge? Saurabh Baishakhia: It is our ongoing commitment to quality and innovation, and our vision to partner consumers at every stage of their modern living by providing lifestyle electrical solutions, which makes us meaningfully different. To ensure that, we consistently make investments in new technologies and in areas of quality improvement, service level improvement and new product development. Quality is one thing we never compromise on. All product that go out of our manufacturing units are tested for quality, durability, and performance. Product quality is extremely important in exports and I feel proud to share that we have been the largest exporter of fans from India for last so many years. We have over 60% share in exports. In home appliances category, all our products are quality certified by a reputed third-party certification agency. We have robust retail presence across India with over 1 lakh retail outlets and a pan-India service network. Our service efficiencies have improved drastically over the last few years and we have been able to close complaints within 24 hours. Orient has evolved with time to embrace technological advances to delight its customers with new and innovative offerings. I am happy to share we are bringing out a great innovation in coolers this season with India’s first modular air cooler. What are the challenges your industry is facing currently? Saurabh Baishakhia: The consumer electrical industry has moved towards adopting higher energy efficiency norms particularly in the home appliances space. We therefore hope that the government will continue to support and encourage this movement with incentives to both consumers and manufacturers, to help investments in this area. Recently, the GST rates in many categories have been revised, and this process of rationalisation is expected to continue. We feel that the GST rate for small appliances should be reduced from 28 percent to 18 percent, for example, in products such as mixer grinders or geysers, which are no longer deemed to be luxury goods. We recommend that the government create a multi-layer GST structure for the electrical appliances industry, like that of cars. The government should also reconsider revisiting the quantum of incentives offered under the budgetary support schemes, to OEM’s, who had set up manufacturing facilities in the hilly states. These OEM’s were provided with area-based excise incentives in the form of excise exemption/refund, which have now been discontinued under the GST regime. The government recently announced a scheme to grant budgetary support in the form of 58% of the Central GST (CGST) component paid by such units. This effectively reduces the incentive - earlier 100% refund – and manufacturers have been forced to increase prices, resulting in the products becoming costly for end consumers. This move could also reduce demand and impact businesses adversely and the government should consider granting 100% of the CGST component paid, as budgetary support. What is your views on counterfeit goods from China? Can they play a havoc on the domestic industry? Saurabh Baishakhia: The imported sub-standard products and components from China is surely a reason of concern. Currently, the low priced counterfeit goods do not go through proper validation and are simply a boxed purchase. With no after sales support and lack of spares, such products have low shelf life which further adds to consumer woes. The viable solution here is to set product standards in imports and give impetus to indigenous manufacturing. With the government support and standardised norms in place, Indian manufacturers can scale up big time and meet the huge demand for electrical appliances in India and can soon become globally competitive. Having said so, I would also like to mention that these counterfeit goods from China cannot play havoc on the domestic industry. The Indian consumer’s purchase pattern and approach to the buying process is evolving fast. The new-age consumer looks at a product as a wholesome package wherein various factors like design, aesthetics, functionality, service and longevity are taken into account. Quality being a key buying criteria, consumers are choosing branded products over poor quality imports. While government is doing its bit, Indian manufacturers must also play a significant role in educating the customers more on this front. How GST is likely to impact the industry... both in positive and negative ways? Saurabh Baishakhia: There is an aberration in GST where in products like small appliances like water heaters and mixer grinders still attract 28% wherein these are bare basics. We hope that the Government looks to the same and brings down the GST rates on the products of basic needs. Government must look at creating proposition so that domestic manufacturing can prosper. Quick actions have already been taken by the government and this aberration must be corrected. GST is helping the organised players gain more market share while putting reins on the unorganised sector. In this scenario, the key to success lies in building in the differentiation amongst so many players. For instance, we are trying to create the pride of ownership for a product category like a cooler which is still considered as a commodity. We believe that there is a good replacement cycle available to us and creating the differentiation in this category will help us create demand. Please let our readers know about your future plans. Saurabh Baishakhia: The appliances industry is estimated to be about Rs. 13,000 – 14,000 crore of which coolers alone account to almost Rs. 1500-2000 crore. On the other hand, water heaters drive almost 1500 crores of business and other domestic appliances stand at Rs. 8000-9000 crores. As far as coolers and water heaters category is considered, we aim to be amongst the top 3 market players by 2020. We are launching 12 new models for this season which will expand the company’s cooler range to 34 SKUs. With our new air coolers range, we aim to fill the existing gap in the segment which is to have smarter and efficient coolers. In our kitchen appliances segment, we are focusing on food preparation sector majorly which includes grinders and blenders etc. In this sector, grinders segment stands at Rs. 300 crores, so that’s a priority market for us and our aim is to reach a high single digit growth numbers in the next one year. We have also not closed our doors for inorganic growth or exclusive tie ups and will continue exploring such opportunities while keeping a keen eye on new and emerging segments within home appliances.